For a slide show of all the great art available this weekend at Art in the Garden click here! This weekend at Art in the Garden you will see these whimsical garden decorations made by Brenda. She also has a collection of sedum plants in the cutest containers! One more day until my garden is filled with art! Friday 4-8pm and Saturday 10-5pm enjoy the last lingering days of summer while strolling through gardens with refreshments while browsing beautiful and locally handmade art. Fused glass art and pendants, pottery, photography, glass and driftwood wind chimes, whimsical garden art, crystal sun catchers, beaded jewelry, and more! Ann Haines - Beadware; Noelle Morris Photography; Linda Ricci - Side Door Pottery; Kandyse Tobias - Blue Fox Glass; Brenda Ackermann - Plants & Plates; Kim Pinkerton - Wind Dancer Glass & Pottery; and Dixie Armfield-Rogerson - Eastern Wind Glass. I have updated the slide show photo links on the right side of my blog page so check them out. I still have to do the Beaded Earring slide show, but I have to decide which ones to feature as I am sure pictures of all 1200+ pairs of earrings I have made is a bit too much to wade through! Many of the items have been sold since the pictures were taken, but I still include them so you can see what kind of work I do. For example, most of the agate necklaces in the Stone Necklace album are selling as quickly as I make them, but I still have a few more loose stones and hope to find more. If you see something you are interested in be sure and send me an email at beadware@wavecable.com. Agate with rust seed beads and gold accents. Agate with bronze and antiqued gold seed beads and a brass clasp. Moonlight with stars and moons. This purple one is already sold! Look at all those glass gardens! I just came back from meeting with Jenny the jewelry buyer at Juliana, a fun little boutique in Port Orchard. Be sure and check them out when you are in the area. For hours and directions go to their Facebook page. I just made this agate, copper and bronze glass necklace this morning! Purple crystals and glass with a honey bee toggle clasp. There is also a purple crystal and pearl bracelet, a double stranded pink pearl bracelet and matching earrings and 2 bead art pins - one in greens and one in purples. Stop in and tell them you heard about their store from Beadware! 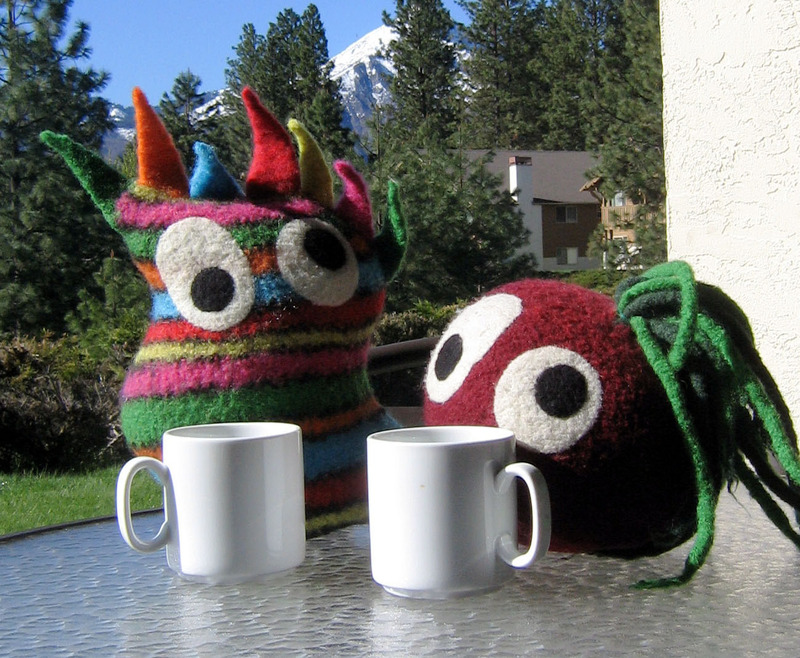 Lennie and Bruce Beet (Snooter-doots™) were discussing the creative process recently, over a warm cup’a Joe. Snooter-doots are the perfect example of originality and inspiration. 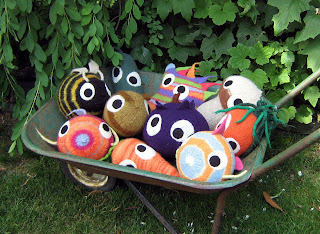 Their artist, Gina McCauley, wanted to make a fun, durable toy for her grand-dog, and as she was already knitting and felting warm hats and caps, she pulled out some left over yarn and started knitting free-form. The results were the origin of what is now the phenomenon called Snooter-doots, whimsical and unique, handcrafted, art-dolls of felted wool. They have morphed a bit from that original creation (which, by the way, the grand-dog loved) into soft-sculpture critters with tons of personality. Snooter-doots are now spreading joy and whimsy throughout the nation when ‘adopted’ by their new forever families. They are even named with birthdays, all ready to go! Lennie and Bruce find it interesting to consider where creative inspiration comes from. True artists find their muse in many places. Snooter-doots are inspired by nature. Gina draws from her horticultural background, love of the outdoors and food, through a system of ‘what if’s’. She designs and develops her own ideas into loveable characters that have become quite collectible. Strict adherence to the artist’s creed, ‘thou shall not copy’, results in unique and original pieces that bring long-lasting joy and pride to their owners. Patrons can best support true and original artistic concepts by talking to the artist about where their inspiration came from and how they make their product. Look-alikes are not original artistic concepts, and do nothing to enhance a person’s collection. Accept only the best, the real McCoy, from a true artist. Snooter-doots are handcrafted in Seattle, WA. They are available online at www.snooter-doots.com and at many fine gift shops throughout the Pacific Northwest. 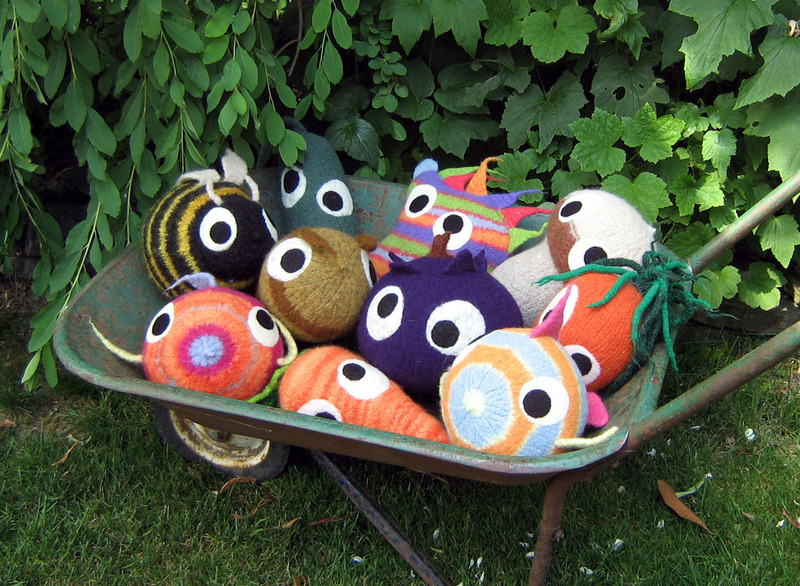 You can also ‘adopt’ them directly from the artist at local arts/crafts fairs and festivals. Follow Snooter-doot adventures on Facebook at www.facebook.com/snooter-doots; Lennie and Bruce would love to meet you! I recently got a lesson in how to spot counterfeit money. An artist friend of mine handles money in her day job and gave me some tips on what to look for. For $10 and larger, hold the bill up to the light with the face towards you and look for an identical face watermark on the right side. There should also be a security thread running top to bottom towards the left side.For when I don't have enough light, or I don't want to be so obvious, she also gave me a spiffy pen that you make a small mark on the bill and it will change color if it is not the real deal. Last weekend I was next to the most amazing painter. Ian has been painting for more than 20 years as well as composing his own music. His latest works are mini-paintings. Original master peices that are very affordable. Mount Rainier is the subject of many of his paintings. You can see more of his paintings and hear his music at his website www.paintedwater.com.